The limited physical release of Saturday Morning RPG for the PS Vita. Second game title published by Limited Run Games, a division of the game’s developer Mighty Rabbit Studios. Only the third physical Region 1 Vita game release to date to forgo having an ESRB rating. Note this game is #3 in the Limited Run Games release series, game “#2” of the Limited Run Games release series is the PlayStation 4 version of this very same title, released on the same date. Limited to a mere 2,500 copies wolrdwide making it one of the lowest physical production run game titles released for the PlayStation Vita. The limited physical edition was sold exclusively through the Limited Run Games website. 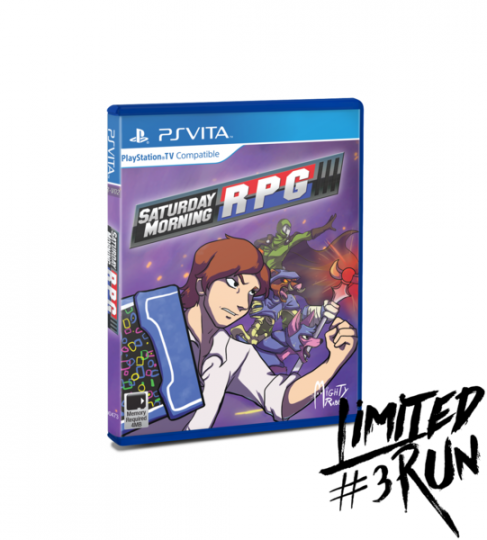 With the release of Saturday Morning RPG, Limited Run Games instituted a new sales policy which limits buyers to just one copy of a game title per platform. This entry was added to the database on Sunday, February 21st, 2016 at 8:47 pm by THEREALDEALDUDE. This information was last updated on Monday, May 2nd, 2016 at 3:43 pm by game_player_s.